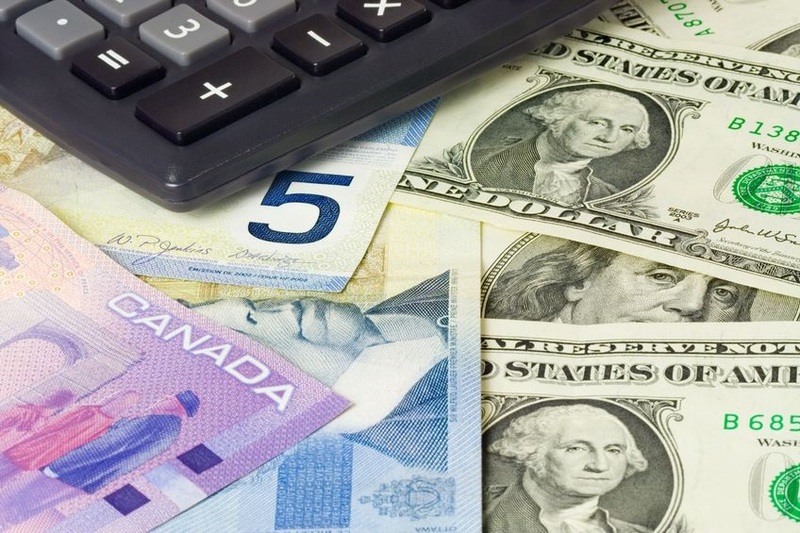 Currency conversion can be a big expense for Canadian snowbirds who spend a significant amount of time in the United States, depending on the current rate of exchange. Unless you have a large reserve of U.S. currency or an income stream in U.S. dollars, at some point you will inevitably have to convert your Canadian dollars to U.S. dollars to meet your living expenses, buy a vehicle or purchase a U.S. property. While you can’t avoid foreign exchange fees entirely, you can minimize foreign exchange costs significantly by understanding how they work and following these tips, which can save you hundreds or even thousands of dollars every year. The difference between what a bank or foreign exchange service pays for a currency and what they charge you to buy it is often referred to as the “spread”. You’ve probably noticed that the exchange rate you see quoted in the news is always better than the rate you actually receive when exchanging currency, usually by a few cents or more. This is because the exchange rates you see in the news are the Bank of Canada rates and the exchange rates you actually receive are retail rates. The difference between these two amounts is the “spread”, and is profit for the bank or foreign exchange company. While the foreign exchange spread may vary from currency trader to currency trader and you can get better rates by shopping around, there is no way to entirely escape it, regardless of how or where you exchange currency. Some foreign exchange methods charge an additional fee on top of the spread that can significantly increasing your currency conversion cost. These fees can either take the form of a flat transaction fee (i.e. $5 per transaction) or a percentage fee (i.e. 2.5% of the amount you are converting). Using currency conversion methods that charge a fee should be avoided whenever possible, unless the additional fee is reasonable and provides you with extra convenience. Banks and Currency Exchange Services usually do not charge a foreign exchange fee, but make sure to ask first. Foreign Exchange Kiosks sometimes charge a foreign exchange fee, but even if they don’t, you should still avoid them, as they’re usually located in remote locations or tourist areas and offer worse exchange rates. Canadian Debit Cards usually don’t charge a foreign exchange fee when you use them in the U.S., but may sometimes, so be sure to check first. ATM Machines almost always charge a foreign exchange fee if you use your Canadian debit card, usually a high one, and should be avoided whenever possible unless you have a cross border banking service with a U.S. debit card. Some Canadian banks have started offering cross border banking solutions specifically tailored for Canadian snowbirds and travellers who spend a significant amount of time in the United States. While the cost and type of services offered varies from bank to bank, they usually include a variety of banking, payment, credit card and foreign exchange solutions. Cross border banking services can be affordable and convenient, but make sure you compare your options first to understand exactly what you’re getting and the fees involved. Sometimes mixing and matching services from different financial institutions can save you more money than using an all-in-one solution. For Canadian snowbirds, using your regular Canadian credit card in the U.S. and other countries can be very expensive, and we recommend avoiding it whenever possible. Most Canadian credit cards have a foreign transaction “fee” in addition to the currency exchange spread, which could end up costing you an extra 2.5% or more on every purchase you make in any currency other than Canadian dollars! No foreign transaction fee credit cards are a great option for Canadian snowbirds, combining cost savings and convenience. They work just like other Canadian credit cards, allowing you to make purchases in Canadian dollars (purchases are converted from U.S. dollars to Canadian dollars based on the foreign exchange rate at the time of purchase). The only difference is that these cards don’t charge the additional foreign transaction fee of 2.5% or more that most Canadian credit cards charge. Another benefit of no foreign transaction fee credit cards is that they allow you to conveniently pay your credit card bill in Canadian dollars, just like you would pay any other credit card bill. This differs from U.S. dollar credit cards offered by Canadian banks, which require you to open a U.S. dollar bank account and transfer money into that account to pay your credit card bills. U.S. dollar credit cards are another good payment option for Canadian snowbirds. They allow you to avoid the 2.5% foreign transaction fee, just like credit cards with no foreign transaction fees. However, purchases made with these credit cards are in U.S. dollars, as are your credit card bills, so you’ll need a U.S. dollar bank account to pay your bills. U.S. dollar credit cards are great if you already have a large amount of U.S. currency, as you won’t have to convert funds to pay your credit card bill. If you do need to exchange Canadian dollars to pay your bill, you’ll have the flexibility of choosing when to convert, which may allow you to take advantage of more favourable exchange rates if you time things right. If you're making a large transaction, such as purchasing U.S. real estate or a vehicle in the United States, or are exchanging significant sums of currency every few weeks to live on while wintering outside Canada, you should explore using a boutique currency exchange service that specialize in larger foreign exchange transactions. Because these boutique foreign exchange companies focus exclusively on larger transaction and have low overhead, they are often able to provide exchange rates that are significantly better than the banks, which can mean savings of hundreds or even thousands of dollars annually. Just make sure you do your homework first to ensure any company you are considering using is reputable and legitimate. Simply put, ATMs are usually the worst for way to for Canadians to convert their money to U.S. dollars. While there are some exceptions, ATM exchange rates are often worse than what you can find elsewhere and there is almost always a large additional fee involved. Using ATMs to exchange your currency should be avoided whenever possible, unless you have a U.S. dollar debit card. While finding the best currency exchange rate is important, convenience is also a big factor for Canadian snowbirds who spend a large amount of time outside Canada and need to exchanging currency on a regular basis. It’s important to balance cost and convenience when deciding which currency exchange services to use, Sometimes, a more convenient solution that saves you time and makes your life easier but has a slightly higher fee may be more desirable that simply choosing the lowest cost foreign exchange option.